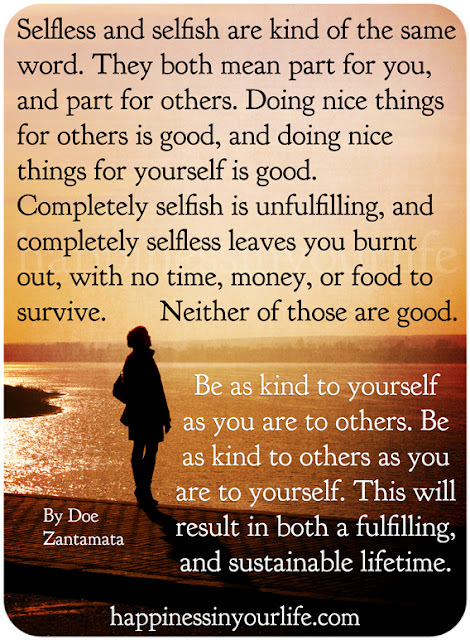 Selfless and selfish are kind of the same word. They both mean part for you, and part for others. Doing nice things for others is good, and doing nice things for yourself is good. Completely selfish is unfulfilling, and completely selfless leaves you burnt out, with no time, money, or food to survive. Be as kind to yourself as you are to others. Be as kind to others as you are to yourself. This will result in both a fulfilling, and sustainable lifetime. 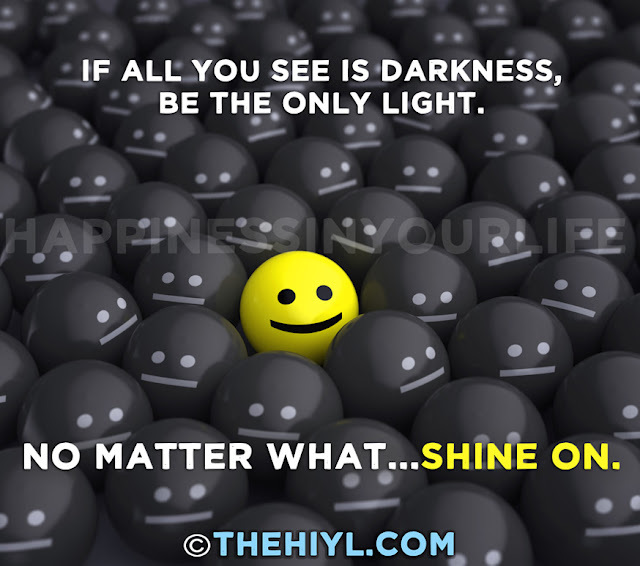 If all you see is darkness, be the only light. 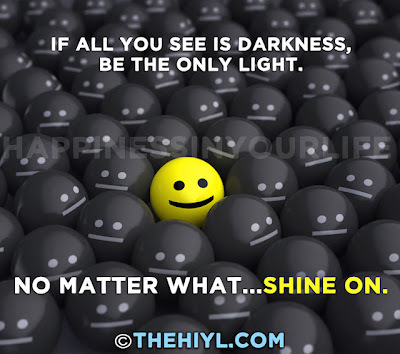 No matter what...shine on. When you do nothing, when you don’t bother trying to be a good person, you don’t get hurt as much. You don't feel wronged as much, and you don't get shocked at how awful someone was, or how just plain mean some people can be. We don't have one world, we have 7 billion different ones, one for each person who lives and breathes. If you do set your personal standards high, you’ll likely be more kind, more giving, more trusting, and more awesome than most people who you encounter. That doesn’t mean “if you can’t beat ‘em, join ‘em.” It means that you’ll have to let go a lot more. You can’t change anyone, but out there in this world, there are a lot more like you who are also wandering around this big maze of a planet looking for you. The longer you hold on to or try to change those who just want to live in misery, the less time you’ll have to meet and spend time with those who don’t. Also, the more you subject yourself to those people and the pain they cause, the more likely it will wear on you and make you think you should give up and just not bother trying to be good, honest, or trusting at all. Don’t give up. Please don’t give up. Just keep on going. When you meet people who see the world in what those others would call an “unrealistic, idealistic, naïve” sort of way, you will have the best friends, the best relationships, and the best laughs and smiles ever. 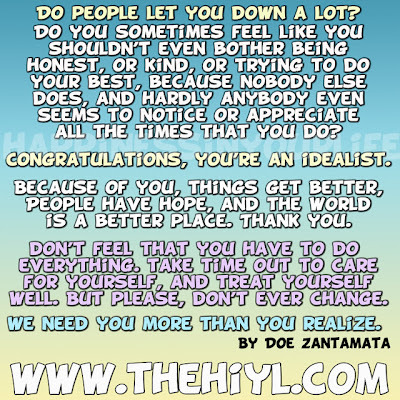 Do people let you down a lot? Do you sometimes feel like you shouldn’t even bother being honest, or kind, or trying to do your best, because nobody else does, and hardly anybody even seems to notice or appreciate all the times that you do? Because of you, things get better, people have hope, and the world is a better place. Thank you. Don’t feel that you have to do everything. take time out to care for yourself, and treat yourself well. But please, don’t ever change. We need you more than you realize. To give for giveness sake means to give without expectation of anything in return. When you give, give without expecting a gift back...not even a thank you. This goes for gifts of money, time, and love. Now, if you've given a lot to the same person and they never give anything back or say thank you, you can feel it inside when you are no longer able to give to them for giveness sake. At that point, it's time to stop giving to them. 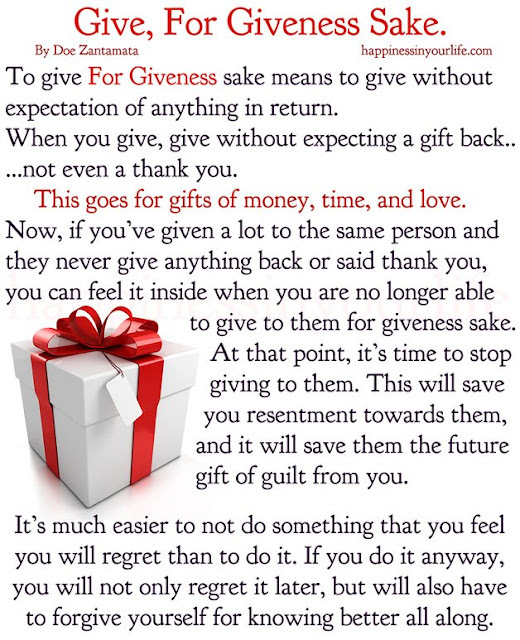 This will save you resentment towards them, and it will save them the future gift of guilt from you. It's much easier to not do something that you feel you will regret than to do it. If you do it anyway, you will not only regret it later, but will also have to forgive yourself for knowing better all along. Overall, there are two kinds of people; those who always do the best they can, and those who do just enough to get by. If you're one who always does your best, you are fantastic. But you also risk being taken for granted and not being appreciated for your efforts. A wise person by the name of Anais Nin said that "we don't see the world as it is, we see the world as we are." So when you're in a relationship with, friends with, or working for someone who is of the "do enough to get by" variety (as many people are), they actually don't even realize just how much time and effort you put in with all that you do. They would not put in that much effort unless they really had to. When you absolutely go out of your way and are totally devoted to everything all the time, people come to expect that of you absolutely all the time. Well you can't be everything to everyone. Eventually, you will burn out. Then, instead of them appreciating you and picking up the slack, you may find that you're the target of disappointment or people wondering what's "wrong" with you as you don't seem to be living up to the standard you had set. In social situations, this can be the person who always goes all out with parties. No expense is spared, they cook from dawn until dusk for days in preparation, the house is immaculate, and all guests are invited to just show up and enjoy. A spectacular time is had by all, and the guests can't wait for the next party. But for the host, aside from the immense cost and time involved, if they're always expected to bend over backwards for everyone, they never get to enjoy the kind of party they love to provide for everyone else. That doesn't seem fair. At work, the one who always goes that extra mile, always stays late when asked, always picks up someone else's work when needed, should be employee of the year. That person should be the last that anyone asks since they already do so much. But instead, they're often the person who is asked first, as for everyone else, they know this person will say yes and come through with flying colors. If anyone else actually goes an extra foot or two, the boss may praise them like there's no tomorrow, and the overachiever feels immediately wronged. That person did one little thing and everyone's cheering, meanwhile they've been doing tons of things for ages and it hardly gets a thank you anymore. 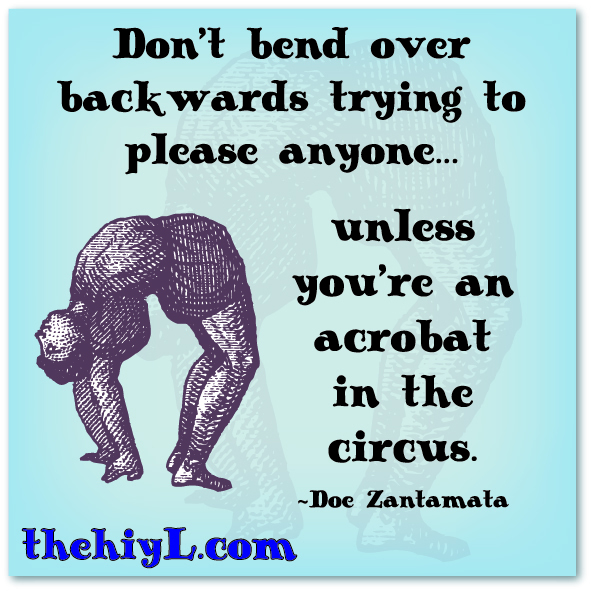 In relationships, again, bending over backwards sets a standard that leaves the other partner with nothing to do. Eventually, they get used to everything being taken care of all the time, and will forget or lose sight of how much effort it really takes to be the world's perfect partner. The overachiever in relationships will eventually realize how much they do and how little their partner does, and will feel hurt and unappreciated. The feeling that is felt in all these situations is resentment. Don Miguel Ruiz in his book, "The Four Agreements," talks in depth about resentment for what he calls, "doing better than your best." It's an excellent read, and highly recommended. 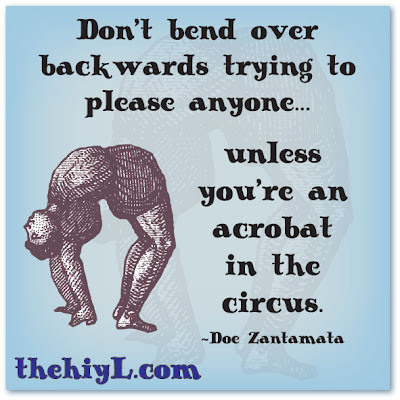 Doing better than your best, overachiving, or bending over backwards will make you resent the other person or other people for doing nothing. To them, this will come as a shock. They've probably heard you say so many times, "It's fine, I don't mind, it's my pleasure" that eventually they believed it and stopped asking. They may believe that you actually like doing absolutely everything and no one else ever helping. Sounds odd...but it's true. 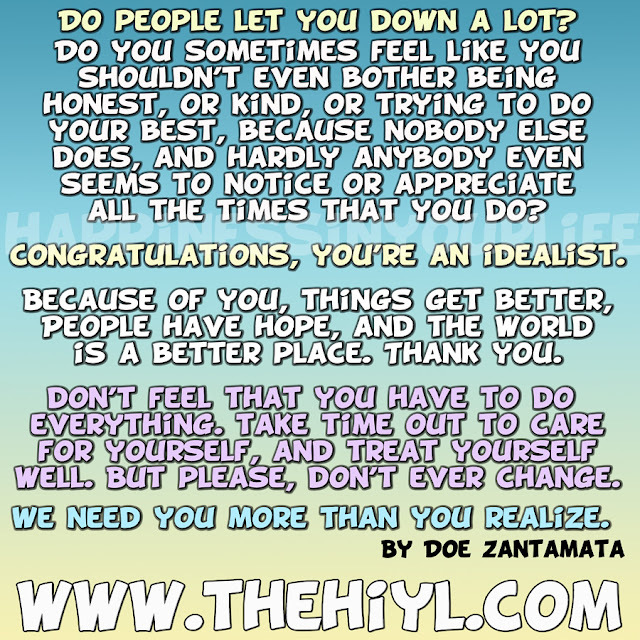 You want to be a good friend, a good employee, a good partner, but you also want to be appreciated. Most people leave jobs and relationships because they don't feel appreciated, so knowing that, it's sabotage to overachieve and then resent those who got used to it. Do your best...yes...always, but when it comes to doing more than that, do so sparingly. Be able to say "no" when something is too much, or when you're being asked too many times to go completely out of your way. Be able to enjoy making great efforts without doing so to the point of being overwhelmed. You can be a kind, good, generous, dedicated, and loyal person to everyone you know and also let them be kind, good, generous, dedicated, and loyal to you. Less is more. When you do say no sometimes, when you don't always leap to assist anyone for anything, you create a respect for your time and your efforts. Then, when you do come through, once in awhile or even several times, it will be noticed, it won't be taken for granted, and it will be appreciated. Plus, you will have more time for yourself to enjoy this life which has been given to you, and you will have the opportunity to let some other stars find their light and shine as brightly as you do.